African design is exploding across the continent and slowly transcending the fashion industry into other areas of the lifestyle space namely home wares and interior design. African aesthetics are both intriguing and beguiling and I am happy to share with you a blueprint to African living. 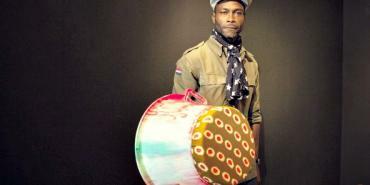 Find out more about African design in this interview with acclaimed Ivorian furniture and jewelry designer Jean Servais Somian. The interview was translated from French to English. Nana Spio-Garbrah: What inspires your designs? Jean Servais Somian: My main inspiration remains nature, the elements that shape it, certain places I visit that overflow with an intangible connotation or reflection of knowledge or cultural exchange, like markets in Africa for example. Nana: What is your biggest challenge as a designer? Jean: The biggest challenge for me in this line of work is to be constant and rigorous in terms of my product quality but also to remain imaginative in terms of my research and my level of creativity, always with the aim of pleasantly surprising myself. Nana: What are you working on at the moment? Jean: Currently, I am working on a few projects, including the interior design and furnishing of hotels, the launching of a design studio and a new line of furniture that I would describe as a conversation between discarded materials of limited value (upcycling) and the nobility of certain raw materials. Nana: You used African print in a lot of your work. Tell us what African cloth means to you. Jean: The 2014 ADJAPADIAI collection, which means ‘heritage’ in N’zima, the local language of Grand-Bassam, Cote d’Ivoire, was a nod to history. African print is a Western creation that we inherited from colonization, but which is now an inherent part of our culture today. As a designer, I wanted to redefine the cloth outside of its primary use, to make it the base of upholstery in the ADJAPADIAI collection.